Magento 2 Affiliate Pro Package is a perfect combination of data feed module and affiliate programs extension developed to simplify selling your products on the marketing platforms. Magento Affiliate Pro Package is a perfect solution for any Magento store owner who wants to start advertising using popular affiliate networks. It consists of two Magento 2 affiliate marketing extensions: Affiliate Programs and Data Feed Generator. 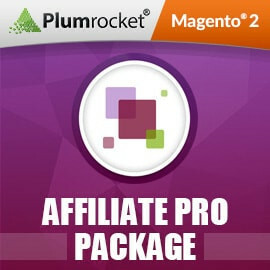 If combined, both plugins will support over 20 different affiliate networks and marketing platforms. The Affiliate Programs extension is designed to execute affiliate pixel on the checkout success page, customer registration and product pages to support both Pay Per Sale and Pay Per Lead affiliate program types. At the same time, Datafeed Magento 2 Plugin helps to generate product datafeeds for affiliate networks from built-in templates including CJ, LinkShare, ShareASale, HasOffers and 15 more. By ordering this package you will not only get reliable tools for increasing sales and revenue, but also improve your traditional search engine rankings and online visibility by driving more traffic from rss readers, price comparison websites, directories and deal aggregators. Using Plumrocket Affiliate Pro Package makes managing your affiliate program a smooth process by helping you join the most popular affiliate networks in no time! What a great pack! I think it's the best combination for guys like me who wanted to launch multiple affiliate campaigns and in the same way to generate feeds for products. The price is good, glad to have it with a discount. My suggestion - do not miss this chance, get it as a bundle. Plumrocket was not a company I knew about before looking into Affiliate Program and Datafeed extensions. Once I found this, I gave it a try. I am so impressed with the amount of support I've gotten from my datafeed. It's been a tremendous source of income for me and I would recommend it to anyone that is looking for a quick and easy way to set up their first affiliate program and datafeed.